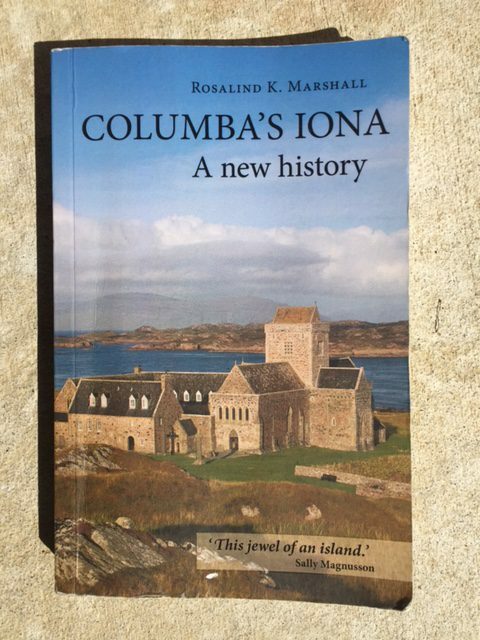 Rosalind K. Marshall, Columba’s Iona: A New History (Dingwall, Scotland, UK: Sandstone Press, 2014) 210 pages plus 24 color plates, 8 black and white plates, notes, bibliography, and index. One must make a significant effort to visit Iona. It’s a small island in the Inner Hebrides, just to the west of the Isle of Mull. Such a trip usually involves traveling by car, bus or train from Glasgow to Oban, a ferry ride to the Isle of Mull, a long journey on a one lane road across Mull, and then a short ferry ride to Iona. Leaving Glasgow on an 8 AM train will allow one to arrive on Iona just before dinner. Despite the remoteness of the island, people have been coming to Iona ever since Columba, an Irish monk, supposedly landed there on Pentecost 563. Marshall’s book, which was commissioned for the 1450th anniversary of Columba’s landing, provides a quick but well researched overview of the island’s history. She refuses to just recite traditional accounts and is willing to call into question many of the legends that exist about the island. Was Columba the first missionary to Scotland? Did he really have 12 monks with him or was this suggested to link his followers with Jesus’ disciples? Was the real reason for Columba leaving Ireland a burning desire for evangelism or were there political factors that caused him to seek a new place to build a religious community? She also raises other questions. Did the carving of large stone Celtic crosses begin on Iona and then spread to Ireland? Unfortunately, there is little written history to allow us to understand all this. What was written, such as a biography of Columba by his disciple Adomnan, included fantastic myths obviously written to enhance the saintly status of the abbot. According to mythology, Columba even chastised the Loch Ness monster after it had eaten a man (supposedly the monster has since found new sources of food). There are four distinct periods in Iona’s history. We don’t know much about the early period, except that the community flourished and became a regional center between Ireland and the Islands off West Scotland. During this era, Iona wasn’t as isolated as today. In the 6th Century, sea travel was easier than traveling overland on non-existent roads, and Iona’s location played a role in its prominence. Even the famed “Book of Kell’s” was produced in Iona. In its second period, Iona’s location led to its demise as the ancestors of Hagar the Horrible (yes, the guy in the comic strip!) sailed down from Scandinavian countries looking for loot. Churches and monasteries were favorite targets for their treasures. On several occasions, Viking raiders sacked Iona and many of the monks were killed. Being exposed to the sea made Iona dangerous and its center of learning, along with its treasures, were moved back to Ireland. However, a few monks continued to remain on Iona and throughout this time, pilgrims did come to the place where Saint Columba died. The island also became a favorite burial place for Scottish and even some Scandinavian kings. The “who’s who” of legend include kings MacBeth and MacDuff, both immortalized by Shakespeare. After the Viking threat faded, Columba’s old community was replaced with a Benedictine abbey which contained the stone edifice that still stands (although reconstructed). Just to the south of the abbey was a Augustinian priory. In the centuries leading up to the Reformation, these two communities, one male and the other female, existed side by side. The ruins of the nunnery have been shored up and can be viewed today. In 1560, the Scottish Church reformed and most priests became Protestant ministers. The communities slowly ceased to exist and in time the roofs collapsed, leaving only ruins. Yet, people still kept coming to Iona, including many notable ones: Joseph Banks, a famous naturalist; Dr. Samuel Johnson, James Boswell, Sir Walter Scott and John Keats, all known in the world of English literature; and the composer Felix Mendelssohn. Although Marshall doesn’t mention it, Robert Lewis Stevenson may have visited Iona. In Kidnapped, the ship upon which David Balfour has been enslaved rounds Iona before it flounders on the Torran Rocks, south of Mull. This area was known to Stevenson as his father had built a lighthouse on the rocks. That lighthouse can be seen at night from the high points on Iona. Throughout this period of time, between the Reformation and the end of the 19th Century, the ruins were owned by the Duke of Argyll. He allowed a variety of religious denominations to hold worship services in the ruins on the island, but no community existed except for those who farmed or fished there. The final period for Iona began when the 8th Duke of Argyll sought to protect and restore the ruins. A staunch Presbyterian, he donated the ruins to the Church of Scotland (a Presbyterian Church) before his death. The deed was transferred with the stipulation that the site had to be open to worship by all Christian denominations. Marshall does a good job navigating the reader through the political and ecclesiastical minefields as debates were held over how best to handle the properties. The Great Depression and a series of wars (the Boer War and the two World Wars) complicated matters. A trust was set up to manage the property and eventually a community was founded by the Rev. George MacLeod, a pacifist Christian Socialist. The two groups (the trustees and the Iona Community) have not always had the same vision, as Marshall illustrates. The primary concern of one was restoration. The other wanted a community that could help build Christian communities. 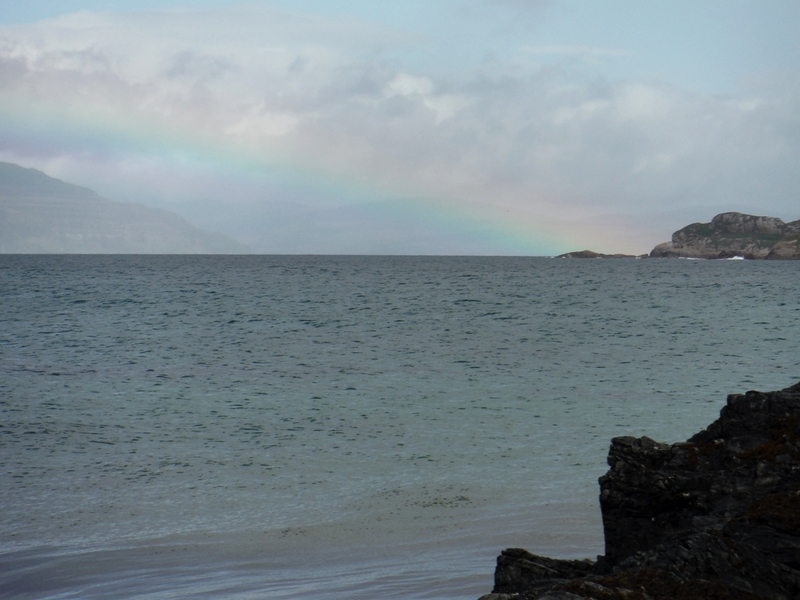 MacLeod saw Iona as a place to train people to go back into the world to work for peace and for the poor. He also desired it to be a place where new forms of worship could be tested. I recommend this book to anyone interested in knowing more about Iona. It was the most detailed history available at the Iona bookstore. The book certainly fulfills the needs of the Trust for a 1450th anniversary book, but personally, I would have liked for the book to have been a little more encompassing and include some of the natural history of the island. Perhaps such a book will be posted at the 1500th anniversary, if I’m around to read it.